Connecticut League of History Organizations - Red Carpet Premiere - Sgt. Stubby: An American Hero! Red Carpet Premiere - Sgt. Stubby: An American Hero! Don't want to see the movie but want to help sponsor a soldier? You can make a donation to help that happen. Your generous donation will be acknowledged during the reception and on our sponsor website! One ticket to the Sunday, April 8, 2018 screening at Bow Tie Criterion Cinemas and the after-hours reception at Omni Hotel. Your ticket also helps sponsor a ticket for a Connecticut National Guard soldier or a member of their family. Be one of the lucky few to see this feature-length animated film starring Connecticut's favorite four-legged hero before it opens nationwide! Sgt. Stubby's story sounds like Hollywood magic, but it's true! Stubby, a stray dog, was rescued from the streets of New Haven by New Britain's Robert Conroy, a National Guard soldier. Stubby was smuggled to France during The Great War and became the mascot for Connecticut's 102nd Infantry Regiment, where he became the most decorated canine in U.S. history. Ticket Information: Your purchase includes one ticket (limit 6 per person) to the screening at Bow Tie Criterion Cinemas and after-hours reception at Omni Hotel. Tickets are non-refundable and non-transferable. Donation Information: Don't want to see the movie but want to help sponsor a soldier? You can make a donation to help that happen. Your generous donation will be acknowledged during the reception and on our sponsor website! Questions? Please contact Christine Pittsley, Project Director, Remembering World War One: Sharing History/Preserving Memories, at the Connecticut State Library: (860) 757-6517 or Christine.Pittsley@ct.gov. The Connecticut State Library, Connecticut Military Department, and Fun Academy Motion Pictures are excited to bring this Red Carpet Premiere of Sgt. 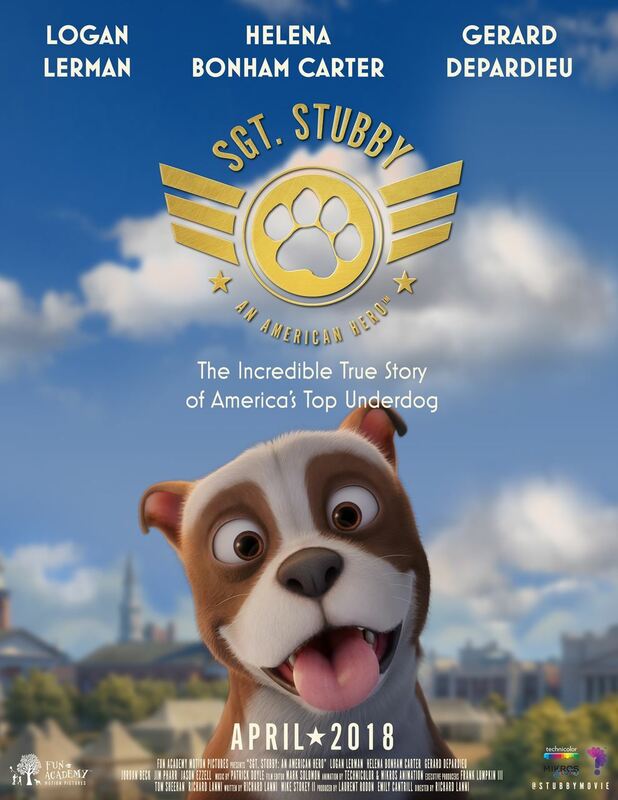 Stubby: An American Hero, featuring the state's most famous and decorated canine war hero and mascot of the Connecticut National Guard! This exciting event will benefit the National Guard Association of Connecticut and honor Connecticut National Guard soldiers and their families by allowing them to attend this once in a lifetime event at no cost! The Connecticut League of History Organizations is proud to be able to help support this amazing event.